Smart Packaging Solutions (SPS) introduces Hybrid 8, a single-module process for hybrid cards that increases the ease of management of eID projects as well as their security while it streamlines the manufacturing process. Olivier Brunet, Marketing and Product Director, at SPS, says: “With SPS Hybrid 8 module, SPS delivers innovative means for card vendors to improve their offer. Hybrid 8 last-step embedding brings additional security, better yields and a demonstrated cost-reduction for their manufacturing process." Smart Packaging Solutions, a world leader in eID documents, introduces “Hybrid 8,” its new module, for hybrid cards (including two chips: one contact and one contactless), an optimized solution that allows last-step embedding, easing the manufacturing process and delivering needs security thanks to simple and reliable processes. With Hybrid 8 module, the manufacturing process for hybrid cards is considerably simplified, as the card manufacturer just needs to embed the module in the card body, in the exact same manner as when manufacturing a contact card. As the Hybrid 8 module has the same dimensions as a contact module, card vendors can use the same manufacturing equipment and the same procedures for all their production. To bring additional flexibility to card manufacturers, the Hybrid 8 module is available both in 470 µm and 550 µm thickness. Custom Module Image (CMITM), a logo on the module of a hybrid card. As Hybrid 8 includes both the contact and the contactless chip, production management is made simpler, more efficient and less prone to errors: as the contact chip and the contactless chip are physically part of the same package there is no need for an additional operation to reconcile the serial number of the contact chip with the one of the contactless chip. Consequently, the creation of a White List including the serial numbers of the contact and contactless chips is made easier and more reliable as no additional operation is needed. Having fewer subparts to assemble to produce a complete card inherently means a cost reduction for smart card manufacturers. 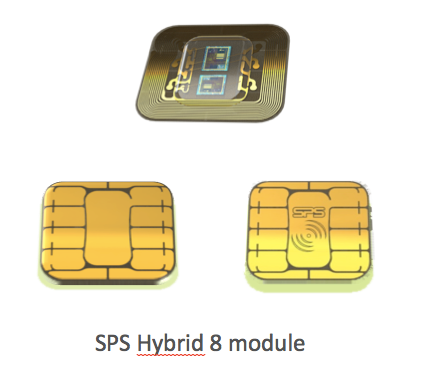 Compared to traditional processes in which card vendors have to source the contact module and the contactless inlay from different suppliers, the simplification of the manufacturing process brought by SPS Hybrid 8 module leads to reducing the complexity of the supply chain allowing for reduced costs and shorter lead times. The SPS Hybrid 8 module allows last-step embedding process: a card vendor manufactures finished printed card bodies, then runs quality acceptance procedures on them, often leading to reject up to 15% of these card bodies because of printing imperfections. With SPS last-step embedding process, cards are embedded with Hybrid 8 module only after these quality acceptance procedures are completed, which means no functional chips are rejected because of printing imperfections. This change in the manufacturing process not only increases the yield, but also drastically reduces the cost of rejects. Smart Packaging Solutions (SPS) will be exhibiting on stand Riviera F 20 at Trustech Pay, Identify, Connect & Secure, an event focused on the entire payments and identification ecosystem, in the Palais des Festivals de Cannes, 28th to 30th November 2017.